I have been meaning to make this fabric up into a t shirt for ages, finally managed it. I love this fabric design soo much (even if the print is bigger than I imagined, must remember always to look at the scale shot!). 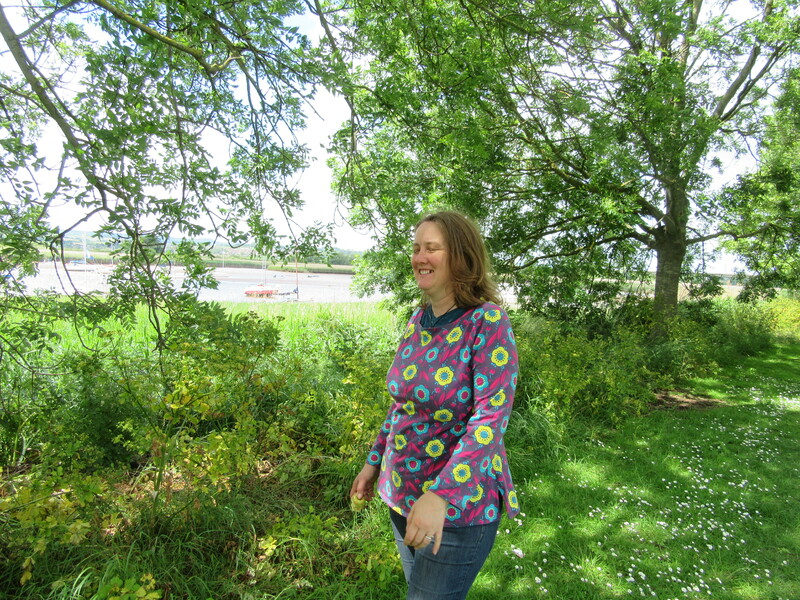 Initially my plan was for a v neck, but in the end I settled on a second Maria Denmark Kimono T shirt – which has quite a boatline like neck which wouldn’t interfere with the print too much. This project eventually jumped to the top of the queue when I was tired and fancied an easy make with quick results. After making my mind up to get going, I then couldn’t find the pattern that I used before. So, my to do list went: reprint pattern, re tape pattern, measure myself, calculate Full Bust Adjustment needed, trace pattern size, “remove arms”*, mark bust apex on pattern (I always do this at least twice then take the average), do a FBA, close dart made, remove new dart, retrace pattern – with masking taped together pens to add seam allowance at same time, add back in arms with seam allowance and finally remember to write description on pattern piece so I don’t loose it again. Not so easy then. (All steps shown above, the first big pic is my finished pattern with the original unaltered stitching line shown in blue). *Actually, the time before I made this t shirt was my first ever Full Bust Adjustment and I messed it up and fudged it. I wasn’t quite sure how to manage one on a kimono sleeve t shirt but according to a comment on Maria’s blog“you just cut off the sleeves, and then put them back on after the adjustment”. Righto. I think I did this right. Next up, the back. I decided that as I’d gone to all that fuss with the front, maybe I should finally learn how to do a sway back adjustment on the front, using this tutorial from Kitschycoo, in for a penny, in for a pound, right? 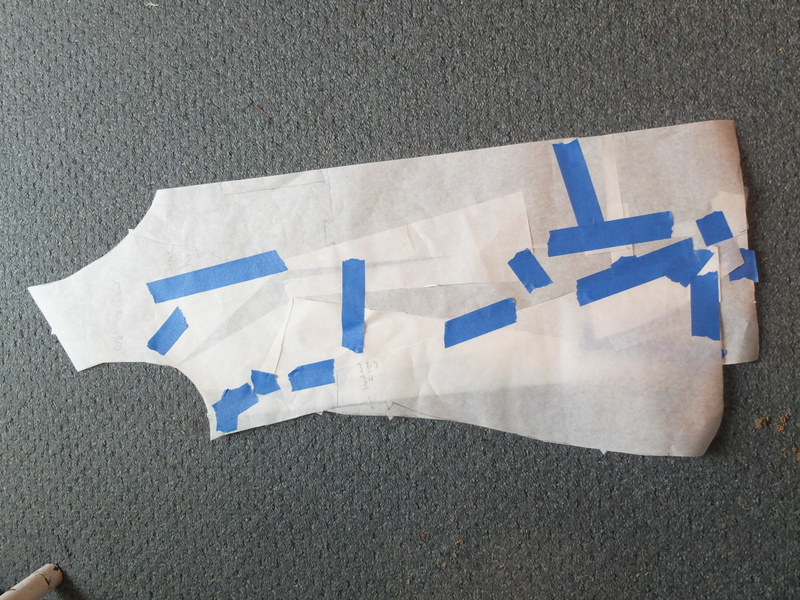 So, more taping (does anyone actually tape the whole pdf together before starting to cut pattern pieces out? ), chose where to do it (err, no lengthen/shorten line as per tutorial, so I chose a handily looking placed join in the taped together pieces), mark wedge to be taken out (in blue) scratch head, re-read tutorial, mark wedge the correct way around (in pink, I’m loosing 2cm height from the centre back here), trace top half of pattern (with seam allowance included trick), mark top part of wedge, rotate greaseproof tracing paper so that line is now at the bottom of wedge, trace bottom part of pattern. See, that wasn’t so bad was it? And now there are two personalised pattern pieces and walking the side seams looks like the side seams are still about the same length. Brill. A short panic about cutting into my precious fabric later (really I should use a fabric I don’t care about to test my fit, but all my jersey is precious), 4 seams (with clear elastic in the shoulder seams) later and I’m ready to try it on. Not too shabby, the swayback has definitely helped reduce pooling in my lower back, it’s a little tight around my ever expanding waistline (no, no happy news here, just pies) and it’s far too long, as despite making this mistake last time, I cut the 4XL length with the L size. Just some finishing to do. Inspired by Dandelion Drift recent shoreline boatneck post I use this variant of this technique to finish my sleeves and neckline in orange ribbing. Happy colours! (I cut the neckline ribbing at about 90% the length of my neckline). This was a bit of a spur of the moment decision, I love the orange but had to trim my seam allowance to get the binding to work as instructed. The inside looks a bit messy but worst of all the sleeve hem is still flipping up in the pictures above. Arghh. Bane of my sewing with knits life. Then I hacked off some inches from the bottom and added a wider orange rib band (so the length ended up back to about where it was drafted, nice and long without being silly). June is upon us and what better excuse than this months stashbusting knit theme is there to break into some of the pretties I’ve been aquirring this year? (OK, this is a lie, I’m not sewing really sewing to the theme, it’s just the theme has rolled around to what I want to sew!). 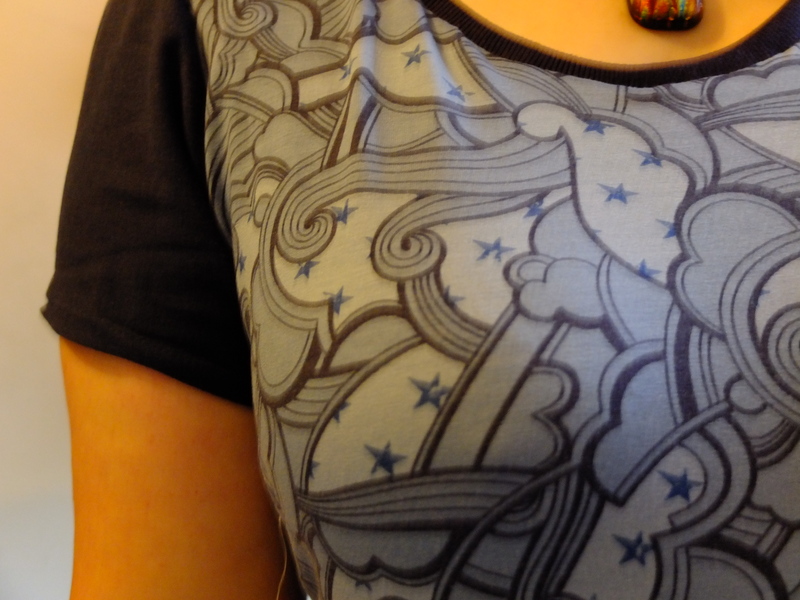 I decided to use some lovely stuff that I acquired from Kitschy Coo to revisit the Coco Top from Tilly and the Buttons. I made this pattern twice last year and I was so pleased with myself! But the ponte fabric that I used quickly pilled and now that my sewing has advanced a little I notice that the fit isn’t the best on them, plus I’m not convinced by the turtle neck on me. However, they still get worn a lot (especially the colour blocked one) due to a lack of long sleeved tops in my drawers (and specifically non stripey ones). This time I remeasured and cut a size smaller (6 not 7) but I did a Full Bust Adjustment. 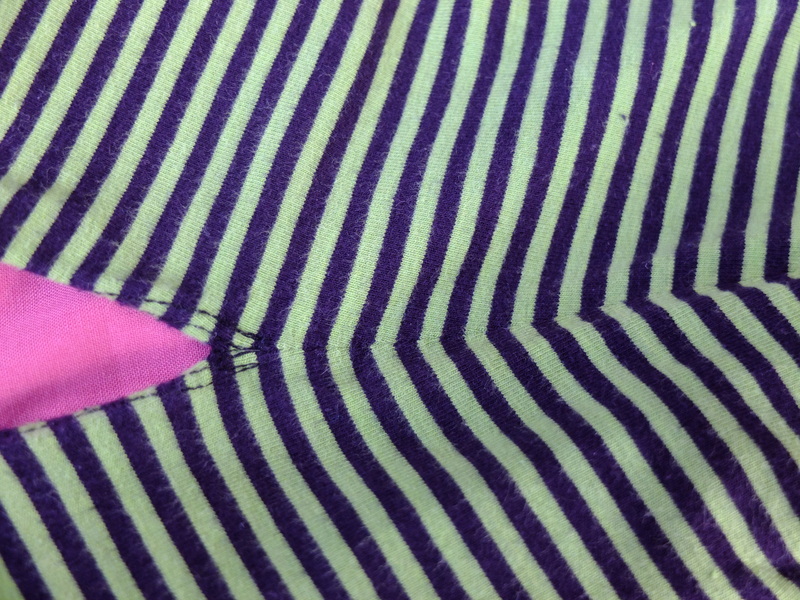 For some reason when I went to cut it the front piece was not playing fair at having the pattern lining up. Four or five attempts later and I called it a day – it’s pretty straight. Also, the piece of fabric was no where near as big as it was in my mind and I only just squeezed it on and the back and the front don’t have the same colour flowers along the bottom (but considering some of the badly matched patterns I now find myself noticing in RTW clothes I don’t think anyone will notice). Anyway, my plans for using the leftovers to make a skort (skirt with combined shorts underneath) for the girl will have to go out the window. There is a smallish piece left though, so watch this space…. I decided that I wanted to up my finishing on the neckline, as Tilly’s instructions are basically turn and stitch (with the aid of hem tape). I can live with unfinished seams on knit tops, but I wanted a neater neckline. Luckily the stashbusting facebook page came to my rescue yet again and I used Heather’s tutorial to cut a facing for the neckline. However, I don’t have a coverstitch machine, so I sewed it to the t shirt with a stretch stitch, then understitched it before flipping it under. Then I folded the raw edge under and twin stitched it from the front. 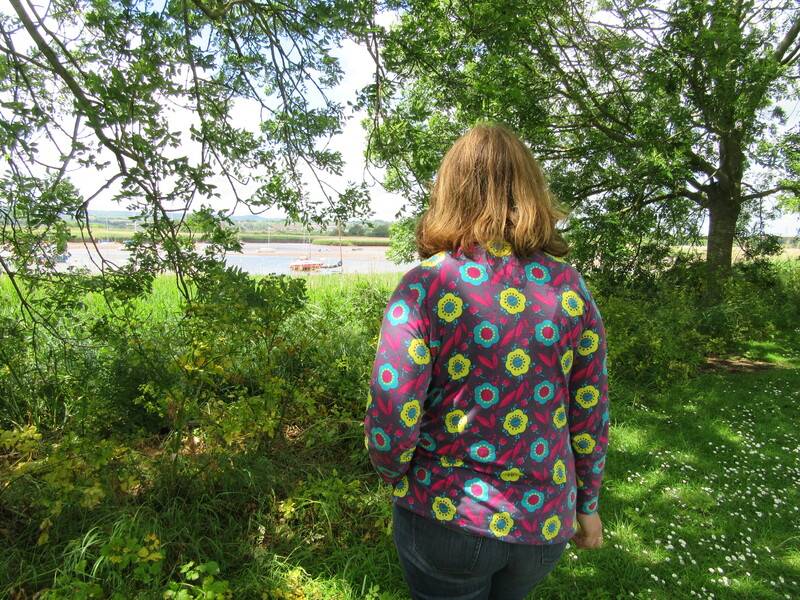 I decided to narrow the seam allowance when sewing my facing on as at a trial try on I was finding the neckline quite wide and I didn’t want to increase it by 5/8″ (I still used 5/8″ at the shoulder seams so that my facing was the same size as my t shirt!). This was fine, except in a couple of places you can now see the stay stitching I’d done at 3/8″ right at the beginning before I’d decided on this course of action. Oh well, the colour match on the thread is good so it doesn’t show too much. (And the reason there’s no photo of the facing is not due to embarassment, rather ineptitude on my part (i.e. I forgot to take one, sorry)). How the devil are you supposed to turn corners with a twin needle? I used Pandora’s tips for threading my twin needle (and I discovered that my machine had a thread holder bar above the needle along the way, suppose I should be using that all the time, whoops) – I’d already worked out for myself to increase the stitch length to 3. Still not sure if I’m using the best way to turn corners, like on the side splits here. The best way I’ve found is to treat the needles like a single needle, leave them down as if it was a single needle, raise the foot and pivot. It’s not perfect but it’s the best I’ve come up with. I decided to try Jessica’s tissue paper trick on the hem. As I suspected although a lot of it pulled away, there was quite a bit of tissue paper left behind. I couldn’t be bothered pulling it out, so I left it there and I’m hoping the rest comes out in the wash. It didn’t seem to make much difference so I did one hem with tissue and one without, for a comparison. I suspect it makes more of a difference on a thiner knit, this Kitschy Coo stuff is really thick and lovely. Also, it would be easier to remove the tissue paper afterwards if you weren’t using a twin needle. I’m glad I did a FBA, I think the fit is a lot better. Next time I will alter the neckline too. 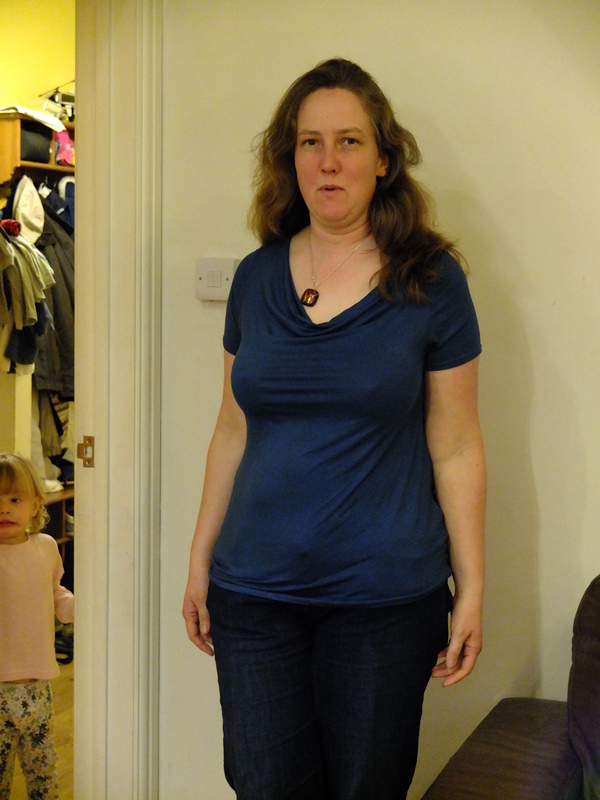 It is a little wide and low for my taste, as it shows any t shirt I’m wearing underneath (and I want this top as an item to layer to help me with dressing in our variable climate) which restricts what I can wear it with. 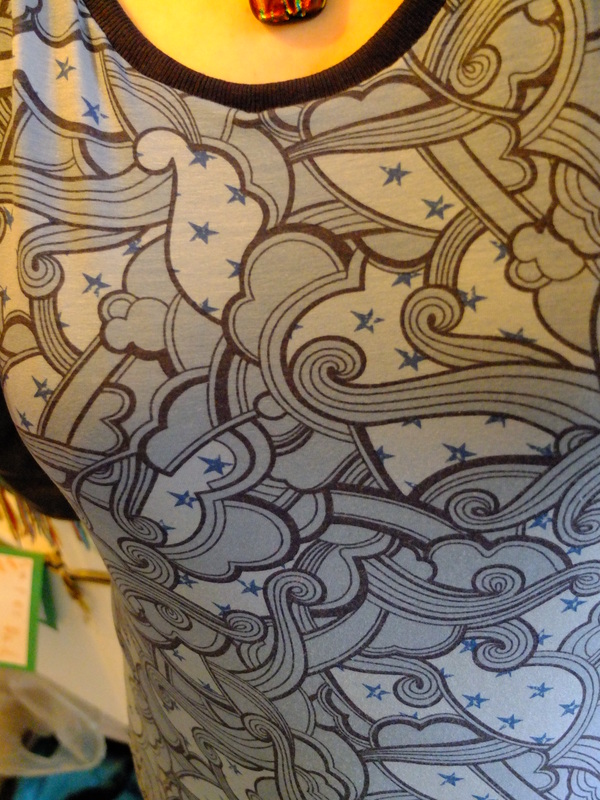 Plus it seems to be gaping a bit at the front of the neckline, despite stay stitching it. Maybe its something to do with how I did the facing? Also, it’s been suggested I try a slopey shoulder adjustment and it’s probably about time I worked out how to do a sway back adjustment too. And what’s more nautical than a hornpipe? Overall, this top is definitely a winner (even if my mum thinks it’s garish, but as she said, it’s not her that’s wearing it). 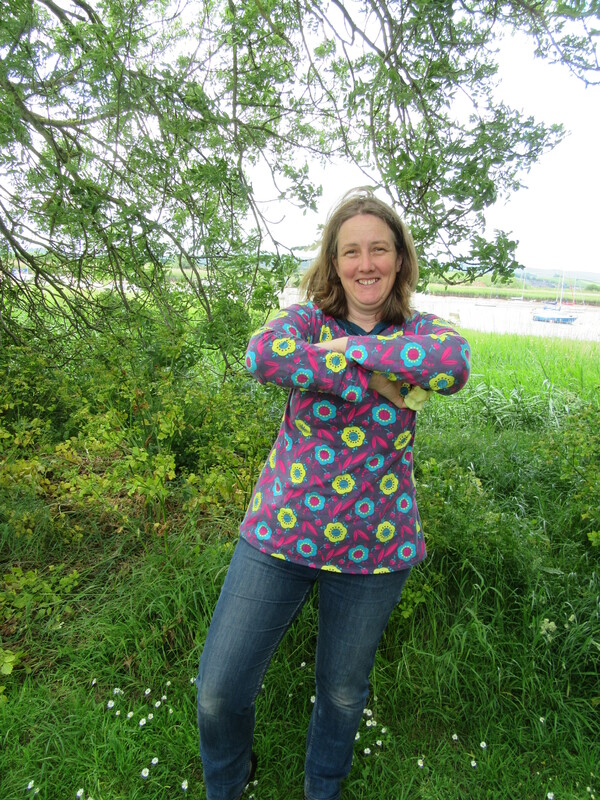 I think of it as my new “seasalt top” as I have a few tops from there that I love but don’t want to buy anymore as they are nearly all stripey (I love stripes but a girl can have enough) and the new ones have low scoop necklines that I don’t want. The fabric is at least as thick and lovely as the sea salt ones and I’m hoping it wears as well too. 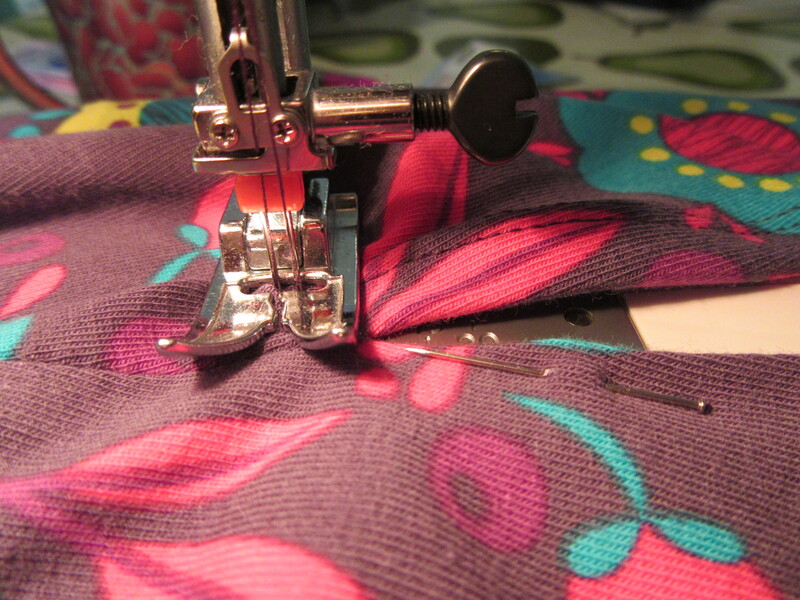 Oh this sewing malarky is good when it works. Being able to make the tops you wish your favourite shops made and add a bit to the length while you’re at it, bliss! Anyone else out there improving on the brands they love? Hello there, how are you this fine spring evening? I’ve had a bitty few days sewing, things have been getting done, but not that much to show for it yet. The boy and I are supposedly working on a joint project but I can’t do much on it until he gets his bit finished. Currently he’s about half done and stalled. I did a bit of mending/adjusting/finishing yesterday. Including hemming my second attempt at the Day to Night Drape top and finishing the last bit of seam allowance on my Tova. (Left at the time as I was considering pockets.) Both are now with the same friend who got my first attempt at a Day to night Drape top, along with the dress she asked me to take up the hem on at the end of last summer (it was pinned and took approx 5 mins to my shame). I decided, after having the Tova on my “alter it in some magical way so I want to wear it pile” for about a year, just to give it to someone that’ll wear it. I’ve also given the copious amount of leftover fabric to another friend. 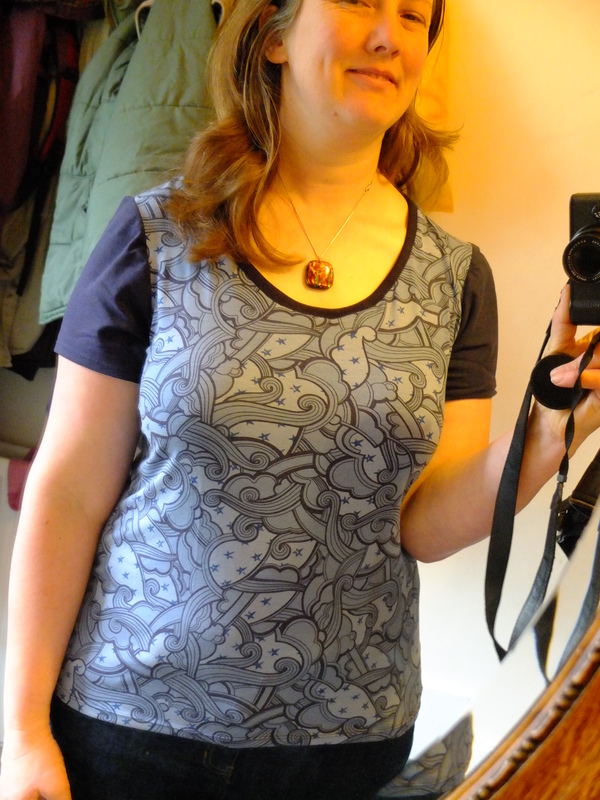 So today I started work on the Jalie 3132 top I got given in the Curvy Sewing Collective Christmas swap. I’m making the (shorter) hip lenth, with 3/4 length sleeves and v neck in some pink and grey stripey fabric from my Slightly Seasoned Pretties layer (bought back in November with a birthday dress for the girl in mind). If it turns out well I have a recently purchased something from my Pure Excitement Layer in mind to make a second one. 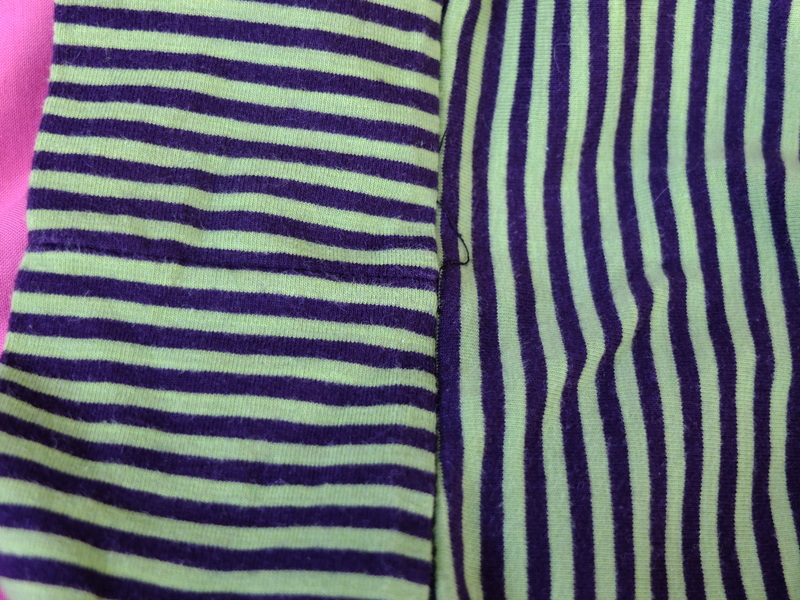 However, I got frustrated trying to get the stripes horizontal and have now started some modesty shorts for The Girl to go with the extremely short nightdresses someone gave her for her birthday (I’ve had longer tops). 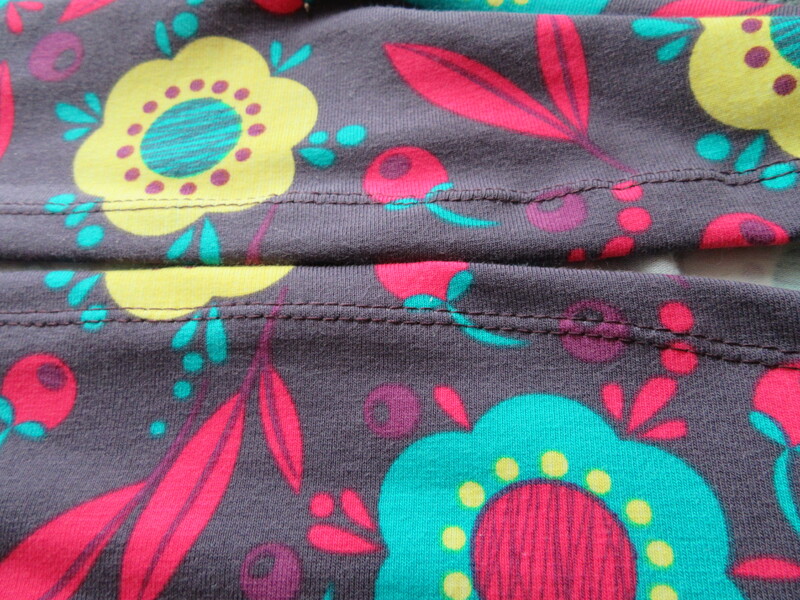 Speaking of which, I might try and put a quick waistband on one in time for bedtime. See you later, happy sewing! So, back in May, I had some lovely green and black jersey fabric burning a whole in my stash and I wanted to make myself something with it to help me take part in Me Made May. I consulted the stashbusting group on facebook and someone suggested that I take a look at Style Arc patterns. This Australian company were new to me and I quickly fell in love with their drapey Billie top and the long sleeved Amy knit top. And then I found out that they don’t do pdf pattern’s, just paper copies, and you only buy one size at a time that. I didn’t think I could justify spending money on a pattern and shipping to get it round the world that may then when it reached me not turn out not to be the right size and I couldn’t make another one in a different size. I searched around for alternatives and found top number 4 in the drape drape book, which I decided I liked better than the Billie, so I made that. But I couldn’t stop thinking about the Amy top, so after consulting with a friend of mine in Australia to check the shipping rates were reasonable I bought it, on the excuse that it was nearly my birthday. The wait wasn’t too long and soon I had a pattern. I hadn’t used Style Arc before (and I’m not likely to use them more than rarely due to the shipping thing) so – first impressions. My size 16 pattern was printed on a huge sheet of paper (think printer paper, rather than tissue paper) to cut out, which suited me fine (although I’d still prefer a multi size). There were little divots marked for pattern markings rather than notches, which looked cute and potential useful. There was a sheet containing pattern illustration, a small sample of appropriate fabric and some very brief instructions. Still, I coped with the instructions being brief, it was a pretty simple make. And I spotted that I traced two identical sleeve pieces before cutting them (a favourite trick of mine forgetting to flip the pattern piece before tracing it a second time, that I’m only just starting to grow out of) – so that was fine. 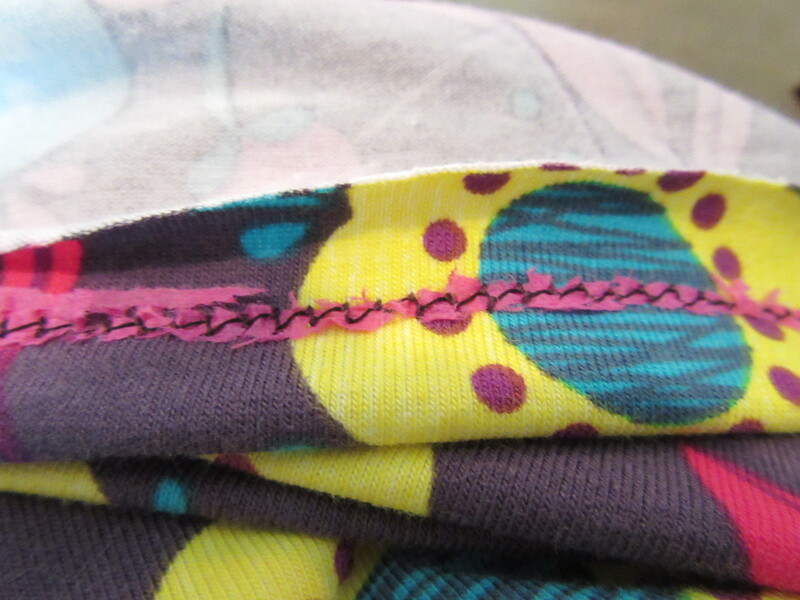 The only thing that foxed me was the instruction to “babylock” the hem ?! After an internet search I decided that a babylocker was a brand of overlocker and I don’t have one, so I used a twin needle instead. Pretty soon I had a top in some lovely fabric. But, well, it’s far from ideal. I was very disappointed when I tried it on. It didn’t look anything like the pattern illustration, which was a long thin top. Mine is more square. Hmm. Obviously this has something to do with my body shape and the fact that the illustrations are very pretty but on closer inspection appear to be of superhero’s (something I vaguely remember about how many heads high a cartoon is, superheroes have more heads in than mere mortals, someone like Andy Capp is only about 3 or 4 heads high). But I was still expecting the top to be longer and maybe to vaguely hint at my waist. I particularly don’t like where the middle of the curved hem falls at the crotch – just at the wrong place to frame, err, my crotch. I think there are a couple of obvious problems. Firsly, my fabric, which is great in itself, but not drapey enough for this pattern. 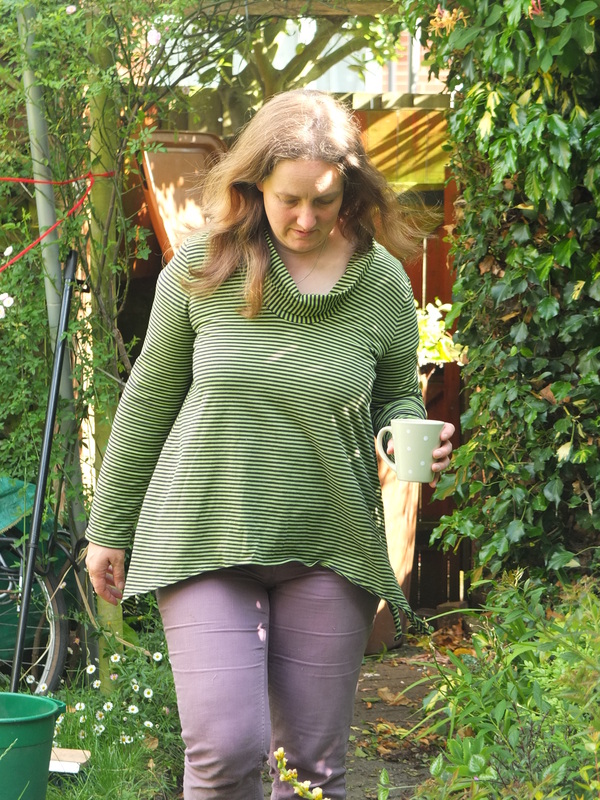 It’s a good quality thick t shirt fabric which I foolishly thought would work, as it’s knit fabric and this is a top that requires knit fabric. But it’s the wrong kind of knit fabric. I wish I’d made a Coco dress out of it instead (I thought it was too thin for that, it probably wasn’t). The lack of drape is really noticable on the cowl neck, which just tends to stay folded in half standing pretty upright, rather than slouching about. I arrange it all slouchy when I put it on, but like my hair it doesn’t take long to pooh pooh my styling efforts and revert to form. The thickness really doesn’t help the body of the top too, adding to the tent effect that is happening from my bust downwards. Maybe I should have paid more attention to the small piece of suggested fabric, trouble is, I had this fabric in mind when I ordered it to be shipped around the world, so I didn’t really give it a second glance. The other obvious problem is that I made this before I really knew what a Full Bust Adjustment was and certainly before I’d come to terms with the fact I needed to make one. In fact, this top is possibly the number one reason I got motivated to learn Full Bust Adjustments. I bought the pattern size based on my full bust measurement, if I’d gone with a smaller size and altered it maybe it would be a little less tent like elsewhere? Trouble is, as you only get one size, I can’t remake it now I have the power of FBA’s at my disposal. 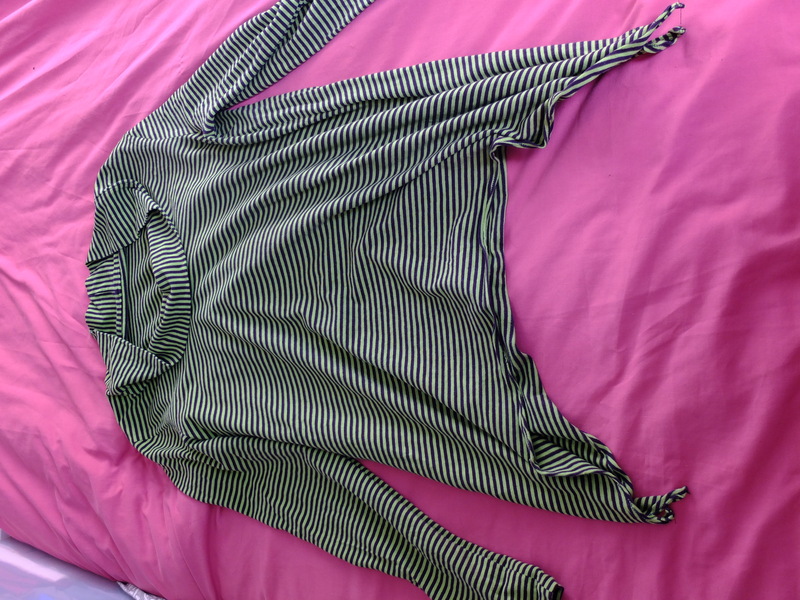 Despite this, I have worn the top a lot. Because I love the fabric. And it hasn’t pilled like my Coco’s. 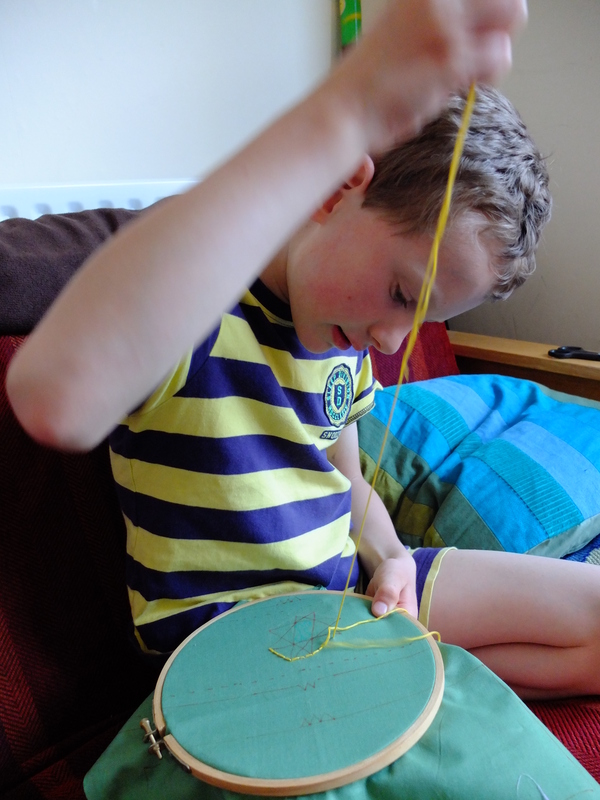 Looking at these photo’s I think maybe i need to reuse the fabric and make a less fabric eating garment out of it – maybe a short sleeved t shirt (the boys looks good after all). I was very pleased with my construction on this, I felt at the time my garment making was stepping up a gear. The stripe matching is very good, if I say so myself, and the seam on the back of the cowl is nearly invisible. Oh, and before I forget, those side bits that you can tie. They’re too short to tie. Seriously. Not that I wanted to. It was my first time stitching in the ditch too. I was all logical and used a stretch stitch and it looks pretty messy (well, when you peer at it), especially where my concentration wavered and I went off line. I have subsequently used a long (length 3 out of a possible 4 on my machine) plain straight stitch on similar garments, which looks fine and has held up so far. Is that what I’m supposed to do? So, there you go, my most worn unflattering garment to date. Do you have something you wear lots despite not liking the fit? I gave away a top I made today. I took a quick photo before giving it away. 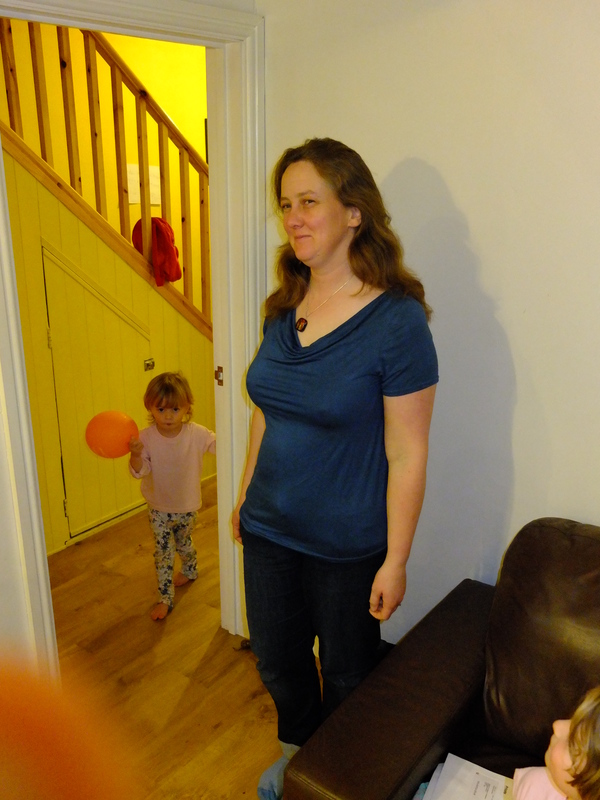 Try and ignore the silly expression (I was in my friends house, with my husband taking a quick photo, being photobombed by three small twirly children whilst my friend and her sister looked on – not the ideal photo shoot). The thing is the fit. 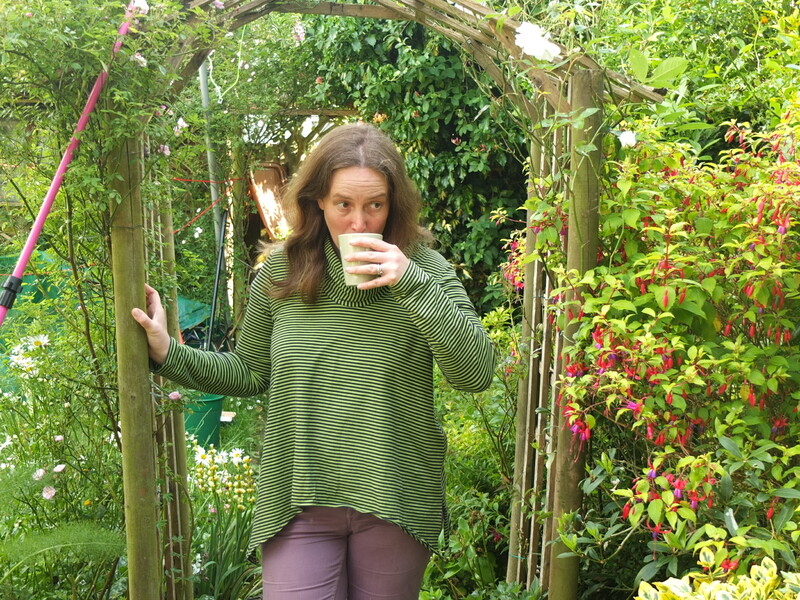 The top is the day to night drape top by Maria Denmark (yes, I seem to have a bit of a thing about her patterns and tutorials at the mo). 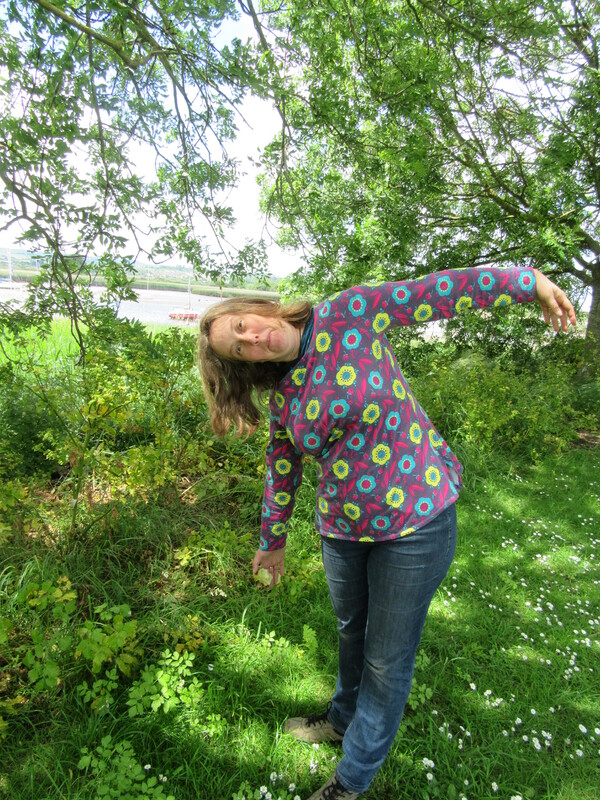 With Birgitte sleeves, as suggested by Maria, because I don’t wear sleeveless tops. 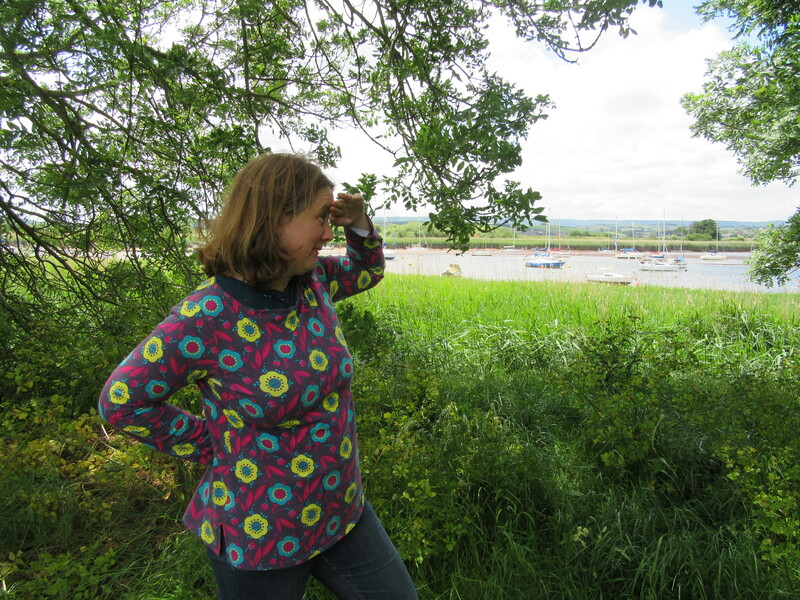 I made it in some petrel couloured jersey from a local shop that I now realise is very similar colour to one of the photographed example top’s on her website – this was not intentional! I’m not sure of the fabric content, but it’s very slinky and drapey and feels cold to the touch. It is, as I thought, quite a good choice for a drape neck, but it’s also a little clingy on me. But then that could be down to the size I cut. I steeled myself to do a full bust adjustment on a drape top. I was a little intimidated. But the pattern suggests using the same method I used before and I figured I just had to ignore the odd looking neckline and concentrate on the FBA. So, I measured my upper bust – 99cm, which corresponds to a large size (with bust measurement 102cm – the medium is 96cm), like I cut for my Birgitte’s. 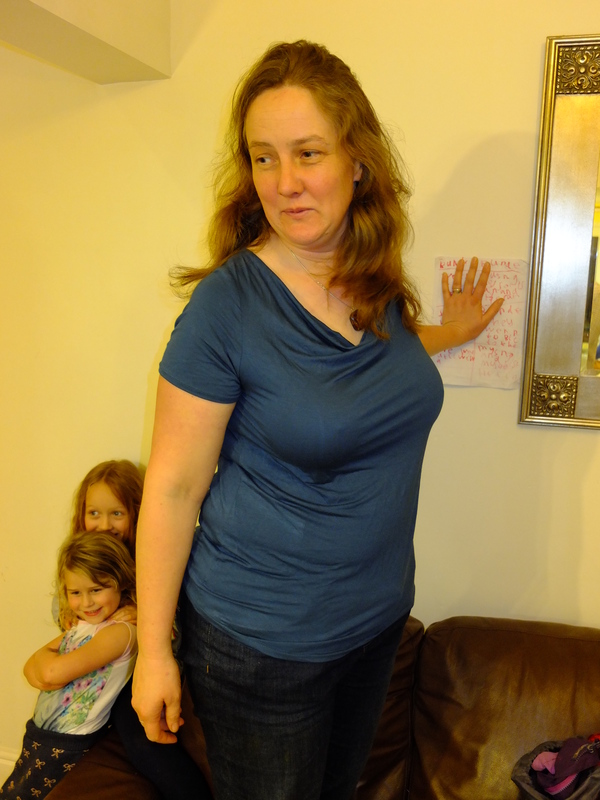 Then I measured my full bust – 103cm. Which is only 1cm above the large bust pattern size. Surely not. I measured again, and again, same answer each time. Surely a 1/2 cm FBA on my pattern piece is not worth it, especially when the pattern says a FBA is not needed for a C cup as there’s plenty of room in the bust. So I blended a large top half of the pattern out to a 2XL waist/hip (which I needed) and cut and sewed that. The result is too annoyingly too tight around my girth despite my novice attempt at blending pattern sizes. Also, I see drag lines going horizontally across my cleavage (this is practically all I can focus on when I put the top on). Surely that means I should have done a FBA? What was I thinking of? Why not add 3cm like I did on both the Birgitte’s and the Kimono t shirt – after all, they’re the same pattern designer. So, I’ve given it away. Despite two friends telling me it looked nice. You know, I think I could live with it if I’d bought it, but it will just bug me no end every time I wore it if I kept it, knowing that I’d spent ages learning to fit t shirts for my bust and then not doing so on this one and then it not fitting properly. I’ve no idea what was going on when I measured myself. 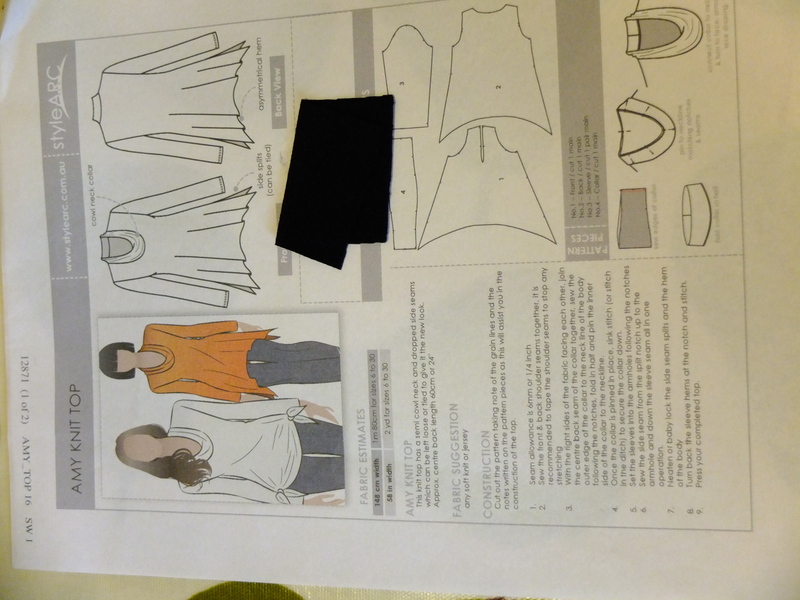 In the future, I will just do a 3cm FBA on all Maria Denmark t shirt patterns until my shape changes. End of. Oh, and sewing the pattern. Well, that was quite straightforward. The pdf came together easily (not sure if that’s Maria’s skill, a fluke or the fact that the paper size didn’t have to be translated to A4 from letter). It’s just two pieces, but I used the Birgitte sleeve too. What I didn’t do was use fold over or invisible elastic as instructed. I didn’t have any, I wasn’t confident of getting some locally, I didn’t need it on the armholes as I was using sleeves, I couldn’t see what good it was doing inside the drape and I thought I could live without it on the back of the neck. Oh and just possibly I was feeling a little impatient to get it done and didn’t want to wait till the shops were open and possibly wait longer still as if I had to resort to ordering online. That decision made starting difficult. I had though to make the top up and then decide if I could be bothered with finding elastic to finish it, but the instructions started with adding the elastic finish to the neck before doing anything else. A quick search later and I found this tutorial from Fehr Trade on cowl tops. Here the edges aren’t finished with elastic, horray, but the shoulder seam is stabilised with tape, which I don’t have. I used some hemming tape before on my Coco tops but I’m not sure it was quite the right product to use and I’ve since lost it. So, in true prolificprojectstarter slapdash style I decided that my folded over seam allowance for the back neckline was my facing and I followed the Fehr Trade buritto method for the shoulder seams. It was a little confusing when pinning as they kept rearranging themselves so I wasn’t sure which was the right side, but it worked fine. Then I just folded over and sewed down my back neckline, after all that worked on my drape drape asymmetric top and no one has ever noticed. And inside the cowl? – I left a raw edge. So, sue me, it won’t show and I’m pretty sure it won’t fray either. The sleeve attachment took a little jiggling. I cut the large Birgitte sleeves and they didn’t seem quite the right size for the armscye, but a little stretching (the joy of sewing with jersey) and it all worked out. It was also a bit wierd working out how to attatch around the cowl facing, maybe it would’ve worked better if I’d followed Maria’s instrustions, but I got round it. Then it was just hemming the bottom and sleeves, which I did with my double needle (still need to get some jersey interfacing to improve the look of that, ho hum, another thing I can’t get locally). In conclusion, construction was fine and dandy (if a little quick and dirty) but the fit was off – due to anomolies of measuring and deciding I didn’t need a FBA and exacerbated by clingy fabric. Anyway, my friend is very pleased to have a new top, she hadn’t tried it on when I left it with her, but she has an old shop bought top of mine that I gave away as it was a little too tight in the bust and so kept riding up (some kind of princess seam going on there) and that fits her fine (she wear’s it often, which is good to see as it’s a nice top), so I think it will be fine. And as she’s slightly taller than me I know she will appreciate the long post baby tummy covering length of this top (one day shops will catch on and make them for people to buy!). I have had enough of t shirts for a while (except possibly for a long sleeved one) and intend to focus on my new knit dress obsession (whilst still ignoring the pile of half finished stuff), but I will try this one again at some point, with a FBA, possibly emailing and asking for advice on sleeve sizing first, and quite probably not in blue (I never intended a new wardrobe full of blue t shirts, I like blue, and I was lacking blue t shirts, but I’m thinking I probably have enough now). If you’re not interested in Full Bust Adjustments, please look away now. If you are, here is a little comparison of some of the techniques I’ve been trying recently. All were done on t shirts, partly as I figured that jersey is a forgiving fabric fitting wise, partly as I had some burning a hole in my stash, but mainly because t shirts are what I usually wear and so are the kind of thing I want to make. I’ve made a couple of Birgitte T shirts recently , so I thought I’d overlay some different adjustments too see how they differ. The green line is the unaltered pattern (in large size, not that I think that makes a difference and fairly obviously the v neck option). 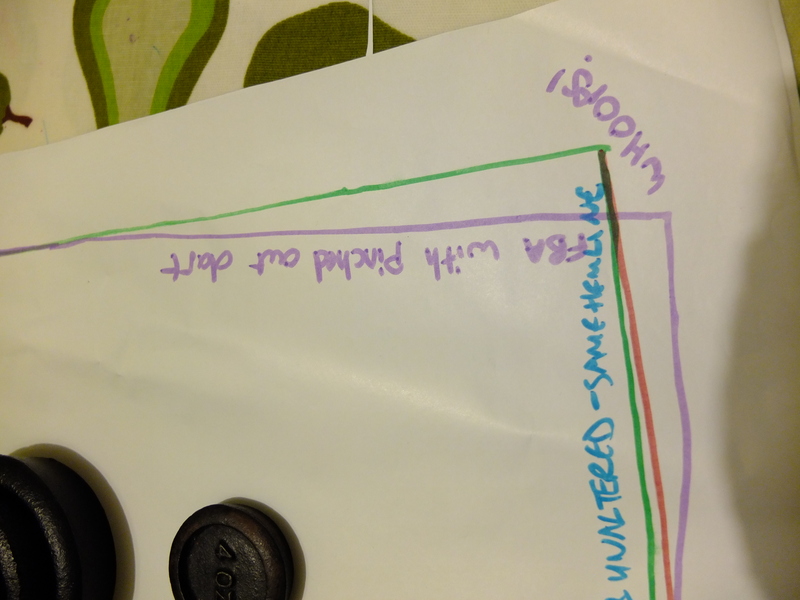 The turquoise line is the Easy FBA from Maria Denmark that I used for my black v neck t shirt with red accents. The armscye seems to stick out a lot further than the rest on this one – which makes sense if you know how the pivoting was done to get this adjustment. But by the time you get down to the hemline this adjustment has blended back to the normal patter line (hence this one being a tighter fit around my girth). Next up is the full FBA done via Maria’s original method, where you pinch out the dart you’ve made and ignore the bump. This is drawn in purple. 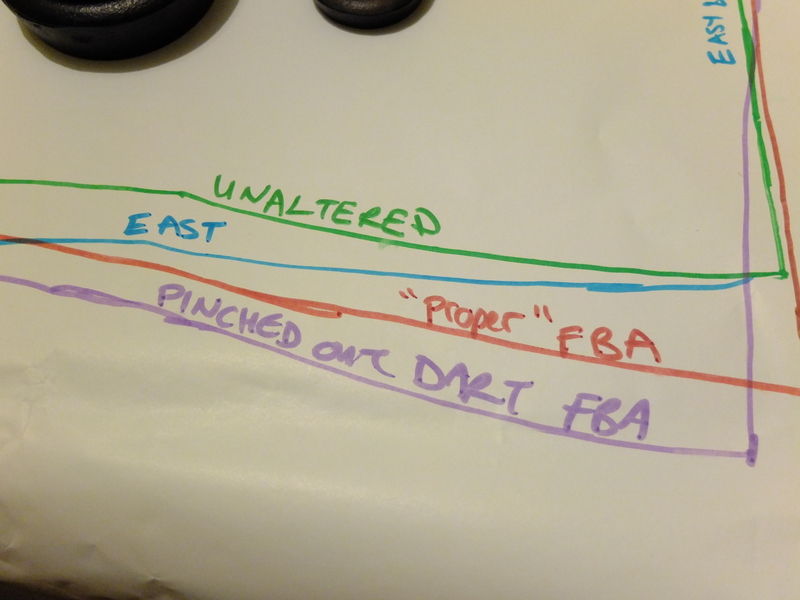 I haven’t actually made up a t shirt via this method, I used it as a step towards on the way to her new improved FBA method, where you eliminate the dart “properly”. Now, I must point out that after I traced this onto my pattern I realised that somewhere in constructing this the bottom half of the pattern had shifted of the fold line somewhat – whoops. So bear this in mind when looking at how it alters the pattern nearer the waistline, that bit kind of needs rotating back to line up on the fold line. I think the armscye is pretty accurate though and in this area it’s very similar to the new improved method that I actually used. Finally, in red is the proper FBA with the extra step to eliminate the dart that I used on my scoop neck Birgitte t shirt. 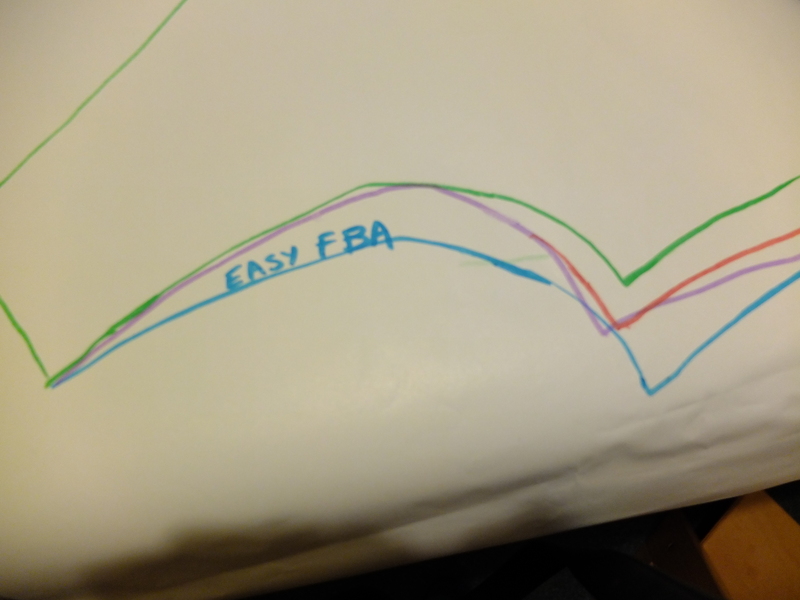 I said last time that the purple line is pretty much a step on the way to this, but when I saw how skewwiff that step was I redid it as part of forming this FBA (but didn’t re trace everything, sorry, was a bit lacksadasical). This fit worked best for me, but that was partly because it adds to the waist measurement, which worked for my current body shape. It just remains for me to say, it’s not that hard to do, I can get a t shirt out of a metre of jersey (and have enough left to make some undies for long suffering hubby) and you’ll get enough change from a tenner to buy a cup of coffee, what are you waiting for? So, I finally finished the latest t shirt – whatdyathink? I have no idea where the golden glow is coming from in this photo. I’m pretty pleased with this one. I’m glad I went with the navy sleeves, I gave up in the end and bought a t shirt especially for the purpose in a charity shop. £3.50! The metre of 70’s stylee fabric was only £4.99 I think, so that’s not really a bargin for much less than a metre of usable fabric. Still, I now have half a navy t shirt in my stash, just in case. Can you tell the photo’s are all selfies? I decided to use them anyway for your amusement. Plus I haven’t had chance to get anyone else to take a photo and now we have relatives staying, so that’s unlikely to happen for a few days and in the pre guest arrival tidy up I even packed away my sewing machine and ironing board, so now I’m blogging to try and keep me going until my next sewing fix (I’m fantasising already, but just realised that the fabric needs prewashing and I can’t easily access my stash right now, argghh). 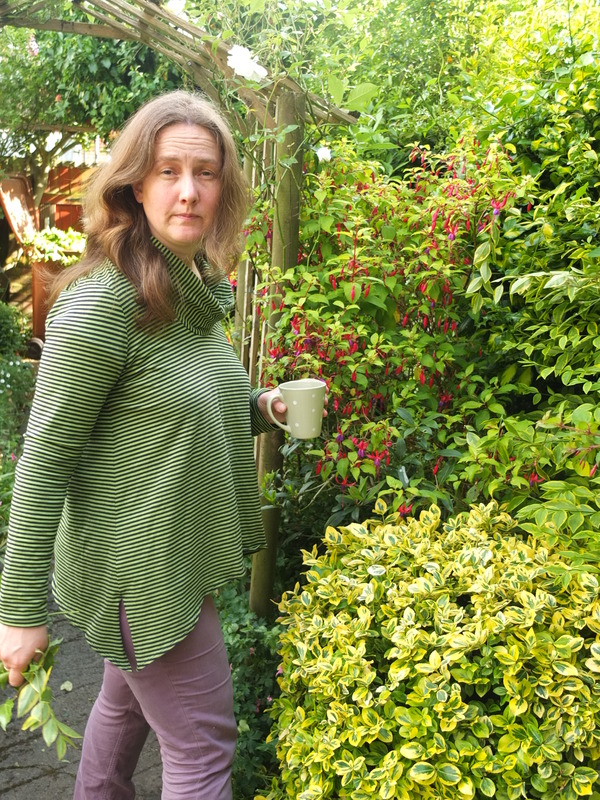 Anyway, the t shirt is another one of Maria Denmark’s Birgitte basic tee (which my mind has accidently renamed a less glamourous sounding Bridget in my head, sorry if that’s slipped out in in text anywhere, I’m afraid it might have). This time a scoop neck, which I like but I wouldn’t like too many like this, I’m used to a higher neckline. 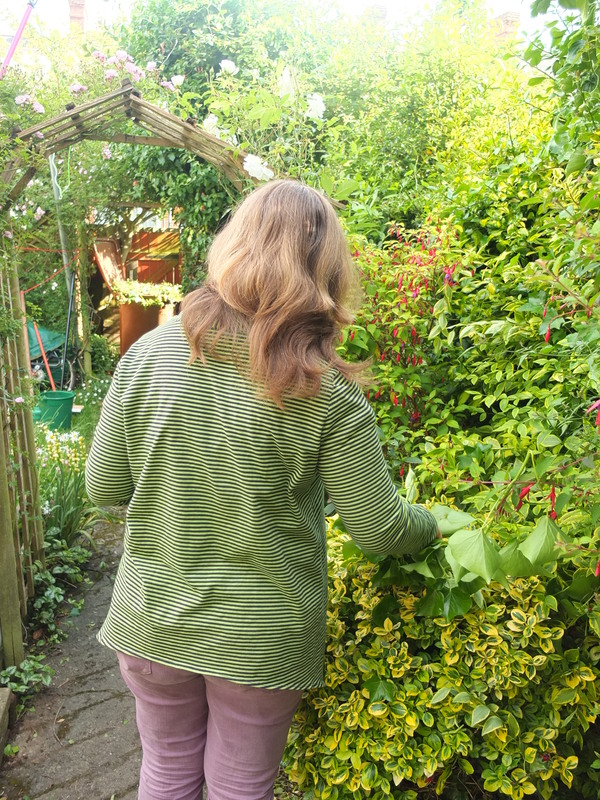 The length is as on the pattern and it’s perfect – I’m so pleased to have a fitted t shirt that doesn’t risk exposing me to the world. I tend to find in shop bought clothes, baggy mens style t shirts are long, fitted womens ones are short. Hurrah for being able to make my own clothes. And my adjustment to the pattern? Would it surprise you to know I did a full bust adjustment, as per Maria’s instructions. 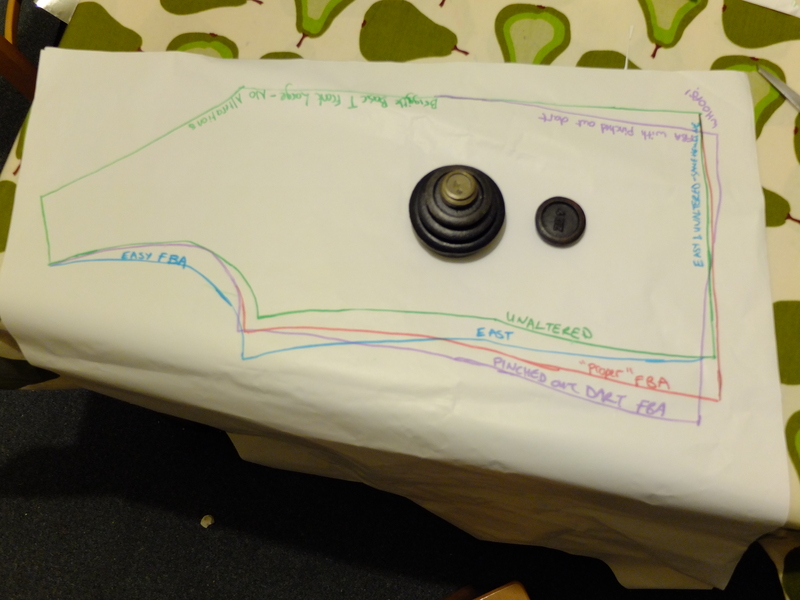 So, this time, I traced the pattern, found my bust apex as before by measuring the distance between my bust apexes (yup, that is as weird a thing to do as it sounds, just makes sure no one walks in on you holding a ruler up to your chest), marking a line on my pattern piece half that distance from the centre front (parallel to my centre front), then holding the pattern piece up to my body and marking the apex on it. I do the hold and mark a couple of times and then use my brain’s in built statistical analysis algorithm (a.k.a. eyeballing it) to mark an appropriate looking depth point on my line based on my splodgey marks. So, apex found, I followed the instructions add in lines (handily that line parallel to the centre front is one I already need), slash, spread and tape extra bits of paper in place. Not too bad. Then to eliminate the dart that’s been added. 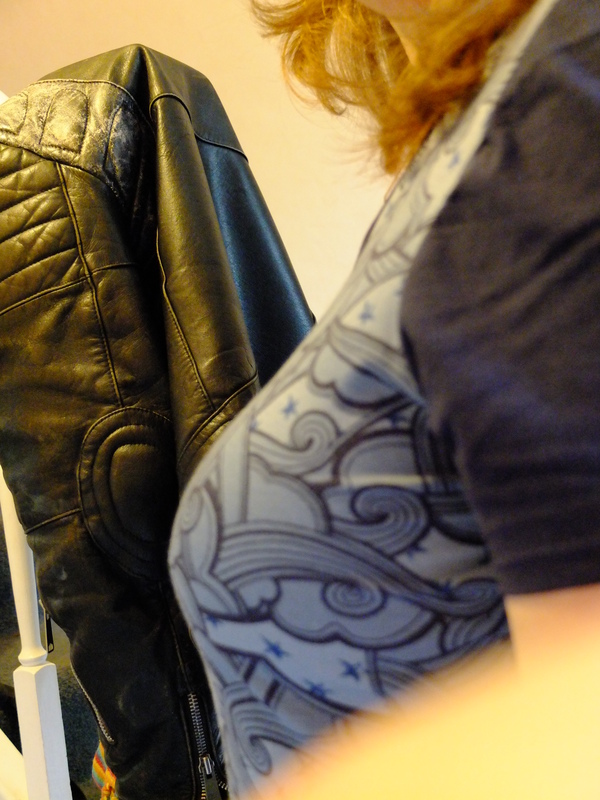 Originally Maria suggested just pinching it out and ignoring the bulge, but I realised when making this t shirt that she has since updated her advice on include how to remove the bust dart. My initial thought was “noooo, more complicated steps”, but in for a penny, in for a pound – and not too long later I had an adjusted pattern. I find the steps that look complicated when you’re researching them are actually easier to get your head round when you have the piece of paper in your hand to manipulate, maybe that’s just me? From then on, it was pretty straight forward to construct. Oh, I altered the sleeves to be a little puffy – I’m not sure it’s that noticable but at least I learnt another new pattern adjusting trick. 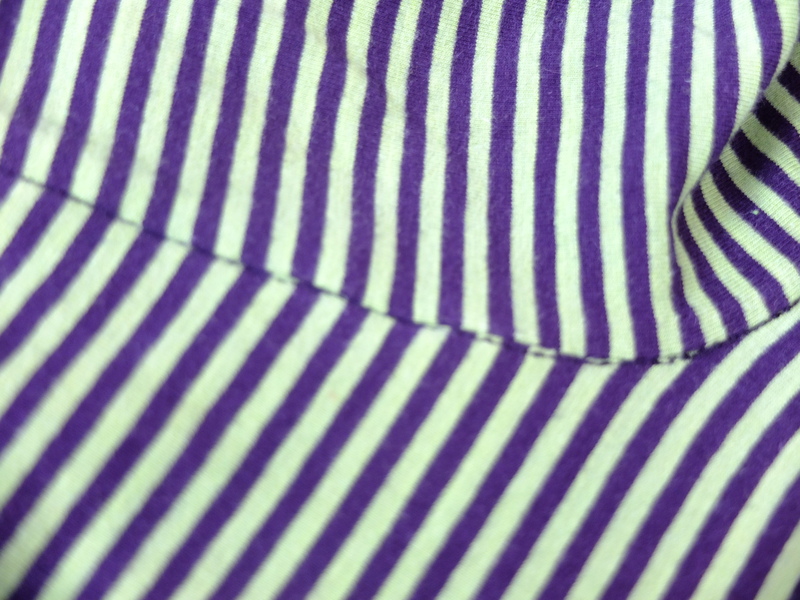 And I pilfered the ribbed collar from an old polo shirt to make the neckband, which maybe I shouldn’t have done as it’s a little stiff, but it’s ok when I’m wearing it I think. 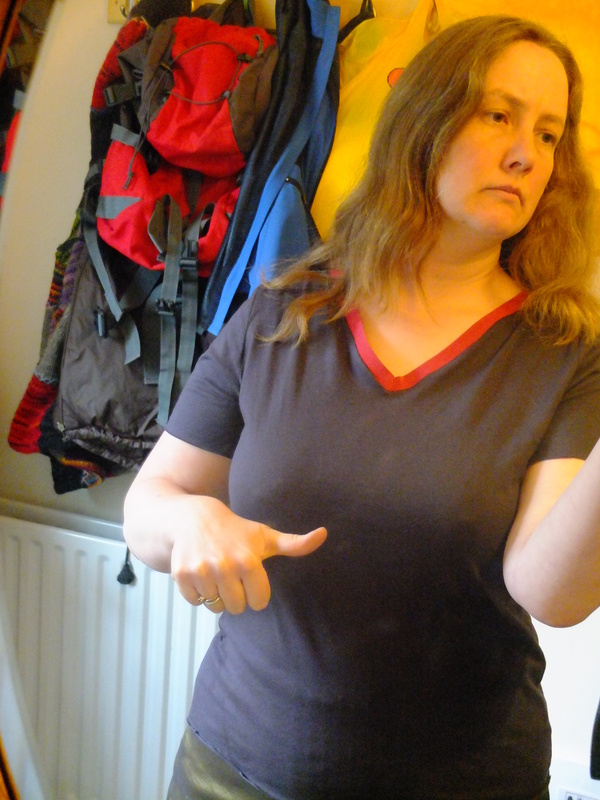 The fit of this Birgitte is much better than the last one because this proper FBA adds width further down the t shirt too, unlike the easy method, and that is width which I clearly need (try as I might to deny it). So, I think I may have got myself a tried and tested basic t shirt pattern, well at least until I go and change shape again. Woohoo. Now my easily distracted brain will want to figure out something more complicated. But for now I award it a Certificate of Basic Competence in FBA’s on Jersey.